#29 "Council of Thieves #5 - Mother of Flies"
Leaderless and disorganized, the city of Westcrown reels after a terrifying incursion from the infernal realm. Yet while fiends stalked the streets, a more insidious rebellion unfolded below. Now a new power rises to lay claim to all of Westcrown! Only the insight of a crazed witch might aid the PCs in curtailing this dastardly coup. But can they hope to stand against the true masters of a city poised on the brink of ruin? A Pathfinder Roleplaying Game adventure for characters of 9th to 11th level. 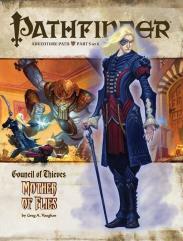 The Council of Thieves Adventure Path is the first to take full advantage of the new Pathfinder Roleplaying Game rules, and works with both the Pathfinder RPG and the standard 3.5 fantasy RPG rules set.